In this player friendly era of free agency in the major leagues, there’s tens of millions of dollars in dead money. What is dead money? And who are the dead players of baseball? It’s the money that teams are paying to many players with long term contracts who are years past their primes. These players once might have been great for a few years when they were productive. But, to recruit them once they became free agents, teams had to give them guaranteed, long-term, contracts. Maybe, after signing fat free agent contracts, they were good for a year or two—-or maybe not—-but now they’re awful. And the teams can’t get rid of them and find better players. The teams are on the hook since a contract is a contract. So the deadmen of the major leagues, who populate most major market teams with big budgets, will go their contracts, their years, as grossly overpaid players. They are major leaguers who eat up huge amounts of money. This is money that could have been better spent on players with promising futures. I could name dozens of players who are eating up dead money. But the bigger issues are who is at fault and is there anything that could change this ridiculous system that subsidizes the worse at the expense of young and promising players in the minor leagues. This deadman playing is a flawed system that reminds me of egregious civil servants who are virtually impossible to fire and must be perpetually paid by already overtaxed citizens. (In New York City, we have “rubber rooms” of failed public school teachers. They must be paid even though they can’t effectively perform. So the taxpayers pay them to do nothing all day but sit in the rubber room. They should move on. There’s nothing disgraceful about failing at something. If you live long enough, it happens to everyone). So who should the fan, who loves this wonderful game called baseball, blame for the deadmen? First, the baseball teams owners are at fault. In their competitive drive, many of them throw tons of money at players without thinking of the long term consequences. Second, the players should also take some blame. Some of them, once they sign a long term contract, don’t take care of themselves. One ace pitcher I know weighs 300 pounds and was, until recently, eating Captain Crunch cereal for breakfast, not exactly a breakfast of champions. The performance of the average overpaid free agent player goes downhill a few years into a contract. But that doesn’t seem to matter to some of them. That’s because they’ll always be paid until that big contract finally runs out. Third, it is the fault of a system of free agency that began in baseball in the late 1970s. The last is a key point. Before free agency evolved—-which basically gives the player the option of leaving the team that signed him and declare himself a free agent once he played some five years in the major leagues—-players had a very different system. There was the reserve clause—which bound the player to one team, unless the team wanted to trade him. That was a very bad thing—-and players usually worked on one-year contracts. But the latter, in many ways, was a good thing. A player, since he had to negotiate a new contract every year, had every incentive to perform well every year; to keep himself in top condition. He had to impress his team and fans every year. Have a good year and he made a good case for a fat raise. Do badly and he was in a poor negotiating position. The bad part of the old system was that you could only negotiate with one team—-the team that signed you and “owned” you. I don’t want to go back to this. I want players to have the same rights as anyone else in any profession—-the right to take one’s services and try to sell them to the highest bidder, if that is what one wants. Still, I also expect the player to do the same thing as anyone who excels or try to excel in any profession: Always give a first rate effort. The player owes that to the fans who pay the ever rising prices as well as to himself. Any player with self-respect wants to finish his career like the Yankees’ Derek Jeter or the Braves’ Henry Aaron, players who gave everything they had all the time. However, today, thanks to the guaranteed long term contract, there’s no politically correct way to say this: Lots of players are stealing money. Given what they produce today, they are grossly overpaid. I’ll mention my favorite team, the New York Yankees, and our prodigal son player, Alex Rodriguez. The great A-Rod signed an incredible, ten-year contract when he was age 32. Yes, he gave the Yankees some good years—-often great in the regular season, usually bad in the post-season. His first four years or so of his 10-year contract were very good. The last three have been somewhere between awful and injury plagued. This year he was suspended for illegally using steroids. He says he will be coming back next year. Alex Rodriguez will be paid some $30 million a year between 2015 and 2017. However, he is unlikely ever to achieve anywhere near what he did in the first five or six years of his contract or when he was in his prime. In my youth, having seen some of the great players of the major leagues, Mantle, Mays, Aaron, Frank Robinson, I know no player 35 years and up ever performed nearly as well as they did in their 20s and early 30s. Yet today’s star ballplayer, enjoying the long term contract that Mays and Aaron never did, is paid for many years at the top rate years after he no longer earns it. That money, which teams were happy to pay early in their careers, becomes dead money at the end of the career. Players with long term contracts rarely, if ever, give good performances at the end of their career, yet they still receive big bucks. That’s bad for teams. That’s bad for the fans. That’s actually bad for the players. Fans often become contemptuous of overpaid players. 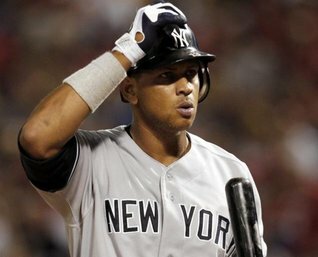 For example, I don’t expect Yankee fans will be welcoming back the controversial A-Rod when he is expected to return next year. That is unless he starts hitting home runs and driving in runs the way he did five or six years ago. That’s something that is very unlikely. So what is to be done about baseball’s deadman problem? I would say that the new collective bargaining agreement (CBA)—-the CBA is the master contract that governs the terms of each individual contract—-should include a clause that says no player age 30 or over can have a contract or more than five years. Under this idea, let’s say a player in his 30s, still performs well year after year into his 30s. Then he could continue to make big bucks because, when his contract was up, he would have more chances to yank up his salary. This system would be more closely tied to performance than today’s. Players could still move to other teams—-this would not mean a return to outrageously unfair reserve clause—-but it would also effectively tie performance to pay as a player ages. A player would have to continue to produce in order to receive big dollars. Do I think this idea of pay for play would ever happen? No, like my idea of restoring the Sunday doubleheader, which I discussed in a previous “What’s Wrong with Baseball” column, it is unlikely to happen in the near term or probably ever, no matter how much sense it makes. Nevertheless, it is time that baseball addressed the problem of dead money. And the next CBA session between the owners and the players association would be a good time to begin.